For BSA Bantam D7 D10 D14 models. Sold as one pair. YAMAHA XV535 VIRAGO (1988-1994) REAR. XV535 S VIRAGO (1995-2003) REAR. SUZUKI YAMAHA. REPLICA BRAKE SHOES. We will always help you to have a 100% positive happy buying experience. A CERTIFIED. PART NO: VB230/210515. YAMAHA XVS650 DRAG STAR (1997-2004) REAR. XVS650 A DRAG STAR CLASSIC (1998-2007) REAR. SUZUKI YAMAHA. 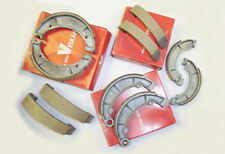 PATTERN BRAKE SHOES. We will always help you to have a 100% positive happy buying experience. PART NO: VB230 / 210515. YAMAHA XV1000/1000 SE VIRAGO (1986-1988) REAR. SUZUKI YAMAHA. REPLICA BRAKE SHOES. We will always help you to have a 100% positive happy buying experience. Add to Favourites. A CERTIFIED. PART NO: VB230/210515. XJ750 RF/RJ/RK SECA (1981-1983) REAR. YAMAHA XJ750 (1982-1984) REAR. REPLICA BRAKE SHOES TO SUIT. A CERTIFIED MAIN DEALER. We will always help you to have a 100% positive happy buying experience. PART NO: VB230 / 210515. YAMAHA XV1000 TRI (1981) REAR. SUZUKI YAMAHA. REPLICA BRAKE SHOES. We will always help you to have a 100% positive happy buying experience. Add to Favourites. A CERTIFIED. PART NO: VB230/210515. Photo for illustrative purposes only. YAMAHA XVS400 (1996) REAR. SUZUKI YAMAHA. REPLICA BRAKE SHOES. MAIN DEALER. Add to Favourites. We will always help you to have a 100% positive happy buying experience. PART NO: VB230/210515. Photo for illustrative purposes only. YAMAHA XV750 VIRAGO (1994-1997) REAR. SUZUKI YAMAHA. REPLICA BRAKE SHOES. We will always help you to have a 100% positive happy buying experience. Add to Favourites. A CERTIFIED. PART NO: VB230/210515. BSA A65 Models 1966 1967 1968 1969 1970. Triumph TR25w 1968 1969 1970 Rear. New, Pair Rear Brake Shoes. B25 and B44 models 1967 fits Front and Rear. Fits The Following Models. UPDATED BRAKE SHOES WITH NEW RACE COMPOUND - LI SX TYPE MODEL NUMBER LE12250 With 50 years of experience, Newfren is proud to offer reliability, safety and a slow rate of wear. Newfren's shoes fit straight on, with no modifications required. Newfren have brake shoes for almost every bike that needs them. Each one is individually machined and checked before being packed, and with more than 650 models on offer, Newfren enjoys world-wide recognition as a point of reference and key player in this market. Newfren products are proudly made in Italy. 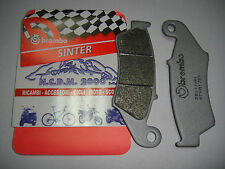 Free post only uk These Brake Shoes fit the following bikes: LAMBRETTA LAMBRETTA LI 125 SERIES 2 BRAKE SHOES - UPDATED WITH NEW RACE COMPOUND - LI SX TYPE LAMBRETTA LAMBRETTA LI 125 SERIES 3 . YAMAHA XJ650 (1980-1984) REAR. XJ650 TURBO (1982) REAR. XJ650 RJ SECA (1982) REAR. XJ650 LK SECA (1983) REAR. SUZUKI YAMAHA. BRAKE SHOES. We will always help you to have a 100% positive happy buying experience. Fits BSA A7 A10 A50 A65 B40 B44 brake shoes. 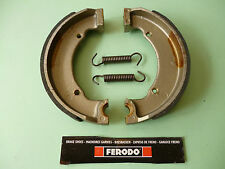 Genuine Ferodo brake shoes. Fits 7" single sided front hubs & Quick detached rear hubs (QD). Sold as one pair. BSA A50 A65 A75 front brake shoes. A75 1969-70 models. A50 1970 models. A65 1968-70 models. Fits 8" twin leading shoe hubs. For BSA Bantam D7 D10 D14 models. Genuine Ferodo brakes shoes. T120 / TR6 1968-70 models. T100 1968-74 models. Triumph front brake shoes. Fits 8" twin leading shoe hubs. Sold as one pair. Fits D1 & D3 models. Sold as one pair. Fits either front or rear. A PAIR OF QUALITY REAR BRAKE SHOES. HONDA OEM PART NUMBER IS 06430-GBJ-K20. EBC Organic Brake Pads FA419. These organic brake pads are now ECE R 90 brake safety test approved and fully T�V tested. In the production only low-emission components are used. These standard materials surpass all previous EBC standard qualities. EBC Organic Brake Pads FA496. These organic brake pads are now ECE R 90 brake safety test approved and fully T�V tested. In the production only low-emission components are used. These standard materials surpass all previous EBC standard qualities. EBC Organic Brake Pads FA291. These organic brake pads are now ECE R 90 brake safety test approved and fully T�V tested. In the production only low-emission components are used. These standard materials surpass all previous EBC standard qualities. Fits BSA Bantam D7 D10 D14 B175 models. Sold as one pair. Fits either front or rear. KITACO POWER UP KIT 57.5cc 210-1000100 FOR HONDA MOTOCOMPO NCZ50 AB12 GET POWER! This is a 57.5cc bore up kit designed for Honda Motocompo foldable miniscooter. It is manufactured by Kitaco co in Osaka, Japan. BIG BORE KIT FOR 2 STROKE MODELS WITH KITACO RACING EXPERIENCES. ※FOR KITACO CYLINDER. MPN 07KA17SX. so cold, hot and under particular conditions (water, sand, mud). A ONLY COST. WE WILL SEND A SUMMARY. UPDATED BRAKE SHOES WITH NEW RACE COMPOUND - LI SX TYPE MODEL NUMBER LE12250 With 50 years of experience, Newfren is proud to offer reliability, safety and a slow rate of wear. Newfren's shoes fit straight on, with no modifications required. Newfren have brake shoes for almost every bike that needs them. Each one is individually machined and checked before being packed, and with more than 650 models on offer, Newfren enjoys world-wide recognition as a point of reference and key player in this market. Newfren products are proudly made in Italy. free post only in uk These Brake Shoes fit the following bikes: LAMBRETTA LAMBRETTA LI 125 SERIES 2 BRAKE SHOES - UPDATED WITH NEW RACE COMPOUND - LI SX TYPE LAMBRETTA LAMBRETTA LI 125 SERIES 3 .